This first-person account by Francis Kowald, S.J., describes one of many floods to strike in the lower reaches of Bear Creek Canyon and Morrison. Due to space constraints, it was not included in the 2014 issue of Historically Jeffco devoted to floods. The writer of this short sketch happened to be an eye-witness of one of such frightful floods, which fortunately took place during the bright day-time. A cow-boy herald gallopped [sic] along at break-neck speed ahead of the swiftly on-rushing flood, some twenty minutes before its arrival and shouting at the top of his voice as he bounded along the road-bed, gave kindly warning, like another Paul Revere, to all residents housed on the banks or living close to the bed of the creek. They who were surprised and caught in the canyon itself during the storm, abandoning every kind of vehicle or truck they had, were obliged to scramble up the rugged mountain-sides, to save their own lives as well as their beasts of burden, if possible and time allowed in such an emergency. Jesuits and students watched the flood from the porches of Sacred Heart College. Morrison Historical Society. This great flood occurred at the beginning of July during the third year vacation-days. (1) The lightning and thunder-storm had spent its fury and the sun appearing once more between the straggling clouds of the recently overcast and lowering sky, was again shining bright and peaceful. The creek was yet low, with scarcely one [foot] high running water in its bed, as we all at the College could notice, when upon the warning given, we had rushed to the porch to witness the terribly strange and ominous spectacle. (2) A few more moments of wild excitement and anxious dread and expectation, and behold! the onrushing torrent hove in sight. On its swollen crest of some three feet abrupt height, it carried the wreckage of some ten small wooden bridges, later rebuilt with reinforced cement, which had been erected for crossing and recrossing the creek along its nine mile circuitous course through Bear-Creek canyon from the village of Evergreen to the town of Morrison. Here it met the ponderous, twice planked wooden bridge, the largest of them all, about 30 ft. long and 10 ft. wide. (3) Here the torrent was arrested for a while in its impetuous course, not more than a minute or thereabout, in trepidation, as it were, of what it next would do, while it rose and swelled in size and piled up its ever augmented debris upon debris, until with a loud snapping and crashing of timbers like the report from a heavy gun, it bodily dislodged and lifted the entire bridge from its firm and heavy moorings and supports on either side and then with a mighty swirl turned and hurled it lengthwise like a huge arrow shot from a powerful bow with lightning speed down the fiercely raging and seething stream. 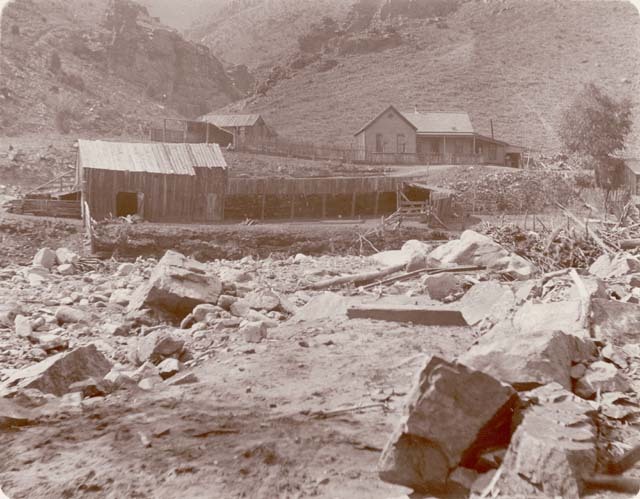 Aftermath of the 1896 flood in Bear Creek above Morrison. DPL/WHC Z-7657. A moment later missing the Depot, it hit and demolished the wooden, octagonal, roof-covered Pavillion [sic], measuring some 15 ft. in diameter and some 12 ft. in height and built some 10 ft. above the creek, which was used as a grandstand for dancing, brass-band exhibitions and other amusements for the town-folk gathered together on certain festivals as Shrove Tuesday of carnival, Decoration-day, Fourth of July, All Hallows and the like, as it was centrally located in the town. With this accumulated wreckage the darting current nearly undermined the foundations of the adjacent Railroad Station and a few yards beyond carried away some 90 ft. of rail-road track with its steel rails still fastened to the ties or sleepers end at the first curve of turn tossed it out of the water and through the garret-floor and roof of a hut, inhabited by an elderly couple, without the least injury to their personal selves. It next spent its rage against the solid masonry and stone pillar-supports of the Railway-bridge across the creek near the gorge east of the town, loosened several flags, measuring 2 x 4 x 8 ft. and weighing tons apiece, and flung them yards away upon the banks below. After a good deal of further damage to cattle, hogs, poultry and a few horses, all of which were drowned in the lowland fields, it hurried along the plain, till finally it emptied or debouched into the South Platte River near Denver, some 16 miles distant toward the east. Fortunately no human lives were lost on this occasion, though a number of previous and subsequent cloudbursts claimed their sad toll of fatalities also among the lowland inhabitants along the banks of Bear-Creek. (1) As the college started in the fall of 1884, we believe the “third year vacation-days” would indicate July 1887, assuming accurate recollection on the part of the author who was writing this account in about 1935. Except where noted in brackets, text and punctuation and spelling are as in the original version. 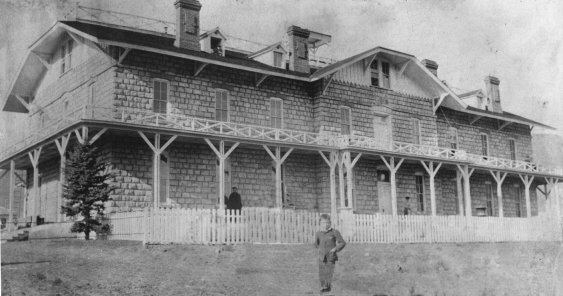 (2) The large building housing Sacred Heart College from 1884 to 1888 sat on a bluff about 200 feet above the normal level of the creek. With few trees at that time to obstruct the view, it is likely that the observers had an excellent vantage point to observe this event. (3) This description likely refers to the bridge at South Park Avenue, which was the main route south of town toward Turkey Creek and, eventually, South Park. From October 1884 till June 1888. From pages 11-13 of typed manuscript housed in Archives and Special Collections, Regis University.